At the end of the last blog entry, I promised something about Norwegian traditions and the holiday season. So here it is. My family is of Norwegian and Swedish descent. At least, my Dad’s side of the family is. My grandparents have both passed away, but my parents, Dad’s siblings, and their progeny proudly carry the torch into the next generation. For the last several years, we’ve made the lefse at my sister’s house in my hometown, because no one else’s house has enough room for us all…or enough breakers to support the extra load of 3 simlutaneously-running lefse grills! The process begins before most of us even get there, with the peeling, boiling, and ricing of Lord-only-knows how many pounds of potatoes. I think there’s a little butter in there, too. But, at the tender age of 3mbvsth, I have not been made privy to the secret first steps of creating the perfect lefse round. Once we are all assembled, aproned, given wine, and placed under some ridiculous form of headwear, the assembly line begins. First, flour is added to the potatoes, one bowl at a time. Aunt Karen has been the head flour-adder for the last several years. I took over part of that duty in 2011, but I doubt any of us are actually quite as seasoned at it as she. Flour is added to the potatoes, and the mixture is formed into small rounds for rolling-out. Rolling is something we involve all generations in. Not shown in the photo are Clayt’s sons, Justin and Nolan, (ages 9 and 7, I believe) who are more than likely responsible for the lefse you see on the board. 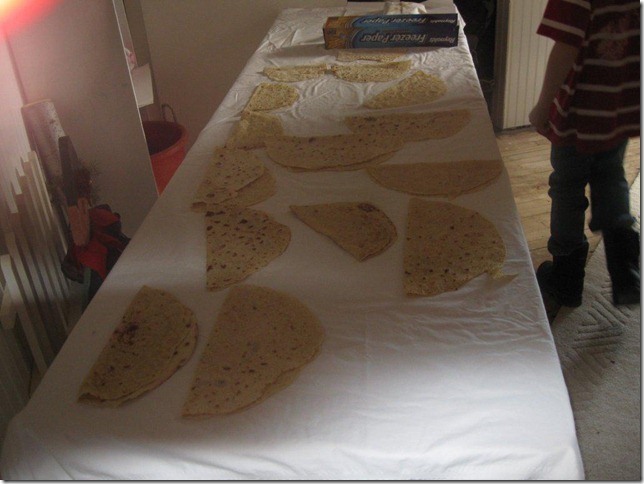 This year, we had the kids down to the age of 3 under close supervision rolling out lefse. The next step is cooking the lefse. 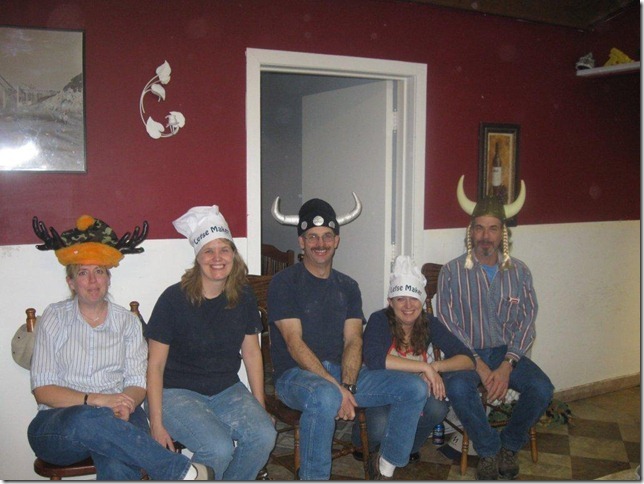 You can see my cousin Stacey in the photo above is there at the ready with a lefse stick. These are used to transfer the lefse from the rolling board to the grill, and then to the finished pile, where it will be left to cool. The lefse grills are much like a regular griddle, made of either cast iron or aluminum, except they are round and about 18″ in diameter. They are also very hot–about 450 to 500 degrees. 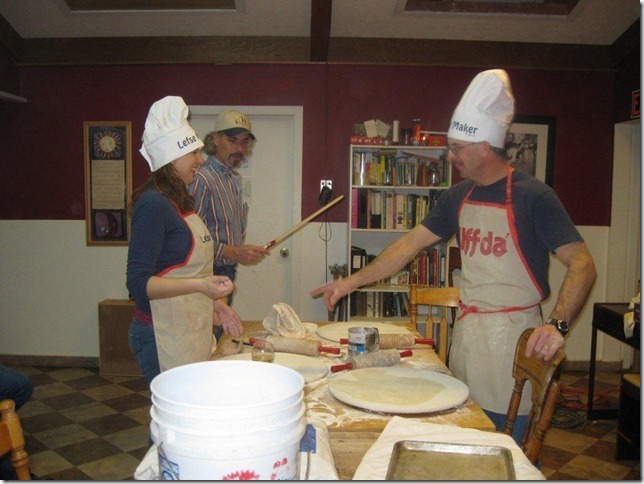 Each lefse is cooked on one side “until there are 63 bubbles,” then turned with the lefse stick until the other side is done as well. From there, they are transferred to the cooling pile, and admired by quality control. Unless they’re the shape of, say, Alaska. Or California. Then everybody gets yelled at. On this day, we honor potato farmers, wineries, and milliners. I will talk about these hats one day in therapy.